Those of us in Michigan who support full parental choice in education face overwhelming odds, but a breakthrough opportunity (with real risks) may soon come from the nation’s capital. For decades, the Michigan Constitution has blocked the path to educational freedom. An amendment adopted in 1970 is arguably the nation’s most stringent ban on any public programs that promote private school choice. Federal action, though, could bring choice to Michigan anyway, though people who support choice disagree on the dangers of that path. Many have reason to fear that a federal program could tie private schools into knots with red tape or keep them from participating altogether. A future administration could wield the power of the U.S. Department of Education to make life miserable for the schools and people who would benefit from the program. Also, maintaining funding and support is more difficult at the federal level, creating fears that someday Washington could pull out the rug from under students and families. As a candidate, Donald Trump floated the idea of spending $20 billion to promote school choice. His administration’s first budget later proposed a much more modest amount: $250 million. At the American Federation for Children National Policy Summit in May, I watched Betsy DeVos, our new secretary of education, laud the president for proposing “the most ambitious expansion of education choice in our nation’s history.” Her powerful keynote address highlighted the need to transform the education system to serve the diverse learning needs of children. Discussions of a possible federal program for school choice have narrowed to one particular model: tax credit scholarships. Businesses and individuals could receive large tax write-offs when they make donations to nonprofit organizations that give scholarships to families in need. Seventeen states currently use this model in some form. 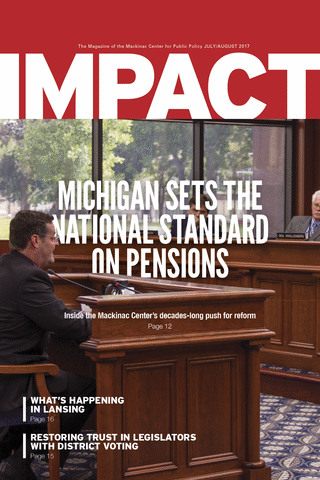 They follow the mold of the universal tuition tax credit, an idea the Mackinac Center pioneered and has championed for nearly two decades. The Center remains Michigan’s outspoken thought leader for educational freedom. A federal tax credit would not necessarily require any new oversight from D.C. States could administer the regulations they deemed appropriate for private schools. While details are unclear, the opt-in model advocated by DeVos likely refers to states deciding whether scholarship-granting organizations could receive federal tax credit donations. Given the opportunity, states with thriving scholarship programs like Arizona, Florida and Pennsylvania might take a pass to avoid potential future federal entanglements. On the other hand, opting in would pose a less tangible threat to states with no private school choice experience and very few prospects for change. Michigan thus could seize a rare opportunity to give many families new educational options. State leaders could override the wishes of groups hostile to choice, while philanthropists could create scholarship organizations to help meet the pent-up demand. Finally, a tax credit scholarship program is probably the only type of private school choice program that could survive the gauntlet of Capitol Hill. Since the legislation would represent a congressional change to the federal tax code, it requires only two simple majority votes and a presidential signature, making it an easier-to-grasp goal than other options. Still, as The Detroit News accurately quoted my assessment of its likely success, “It’s going to be, probably, difficult.” Today’s national politics are especially brutal. Yet compared to Michigan’s current options, this uncertain path carries a great deal of hope. Should momentum build for Washington to open the door to private school choice, our state must be prepared to enter. The Mackinac Center will welcome Michigan to the growing company of private school choice states.